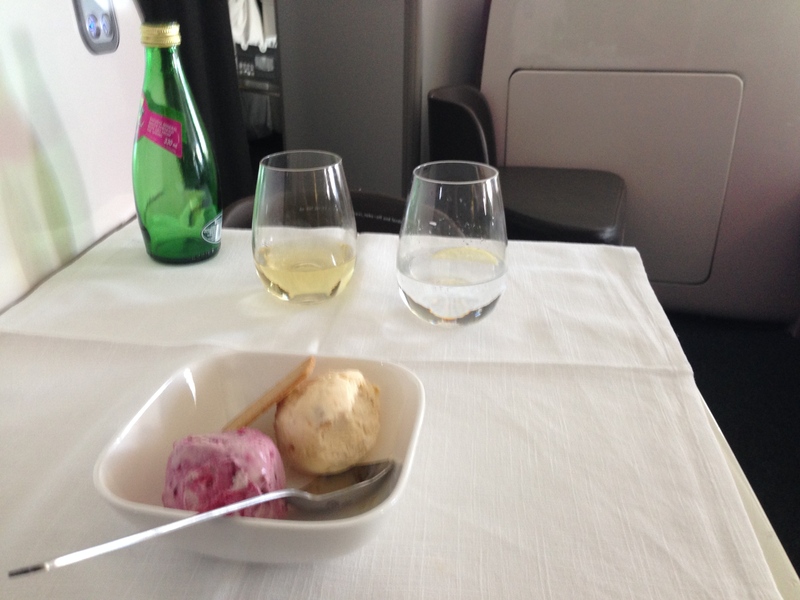 On a recent flight from Auckland to Perth I managed an upgrade to Business. Not my usual mode of travel – though wish it was. 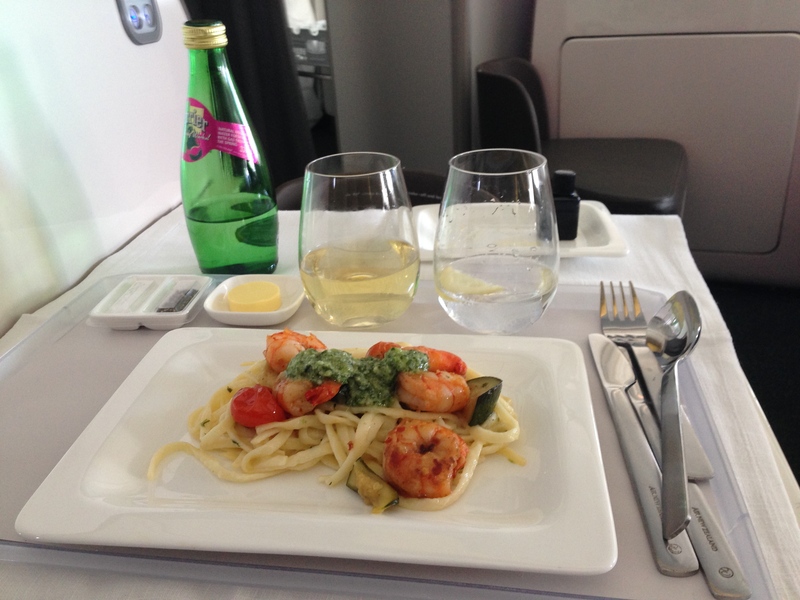 The luxury of plenty of leg room, great service and tasty food certainly makes the hours go faster. 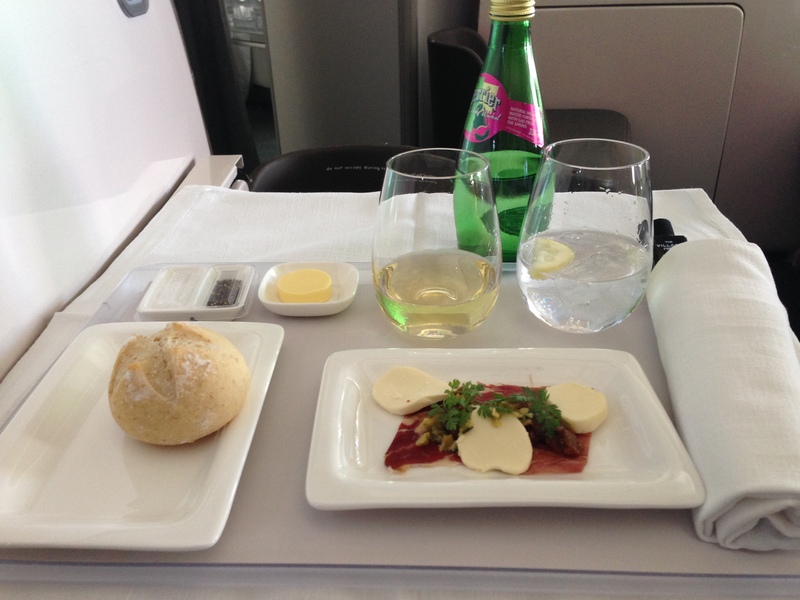 On this flight it was the lunch menu, and I enjoyed every morsel. Oh, and just the difference of real cutlery, china plates, thick napkins – makes it all the better. First up was Prosciutto with preserved figs, bocconcini and green olive salsa. I didn’t feel like meat, so left the Prosciutto, but everything else was delicious. The salsa was just the right mix of olive and tang. This was one of two dishes created by Peter Gordon. The other was Beef short rib, but not being a beef kind of woman, I didn’t choose that for the main. The two other choices for mains were Roast Chicken with chorizo crushed potatoe and Garlic and chilli prawns. Chicken schmicken, we cook that all the time at home, though prawns are a bit more of a treat. A little wait, time to savour the Vidals Chardonnay (damn, didnt get the details, but it was Very Good). Then onto the Garlic and Chilli Prawns on creamed basil linguine with courgettes, fresh pesto and cherry tomatoes. Totally surprised, in a good way, at the strength of the chilli, it was spicy enough to leave a tingly tang – often food for the masses is just a little short of hot. The basil taste went well with the garlic and chilli – and have to say there was nothing left on the plate. I was feeling pleasantly full, but just couldn’t turn down the dessert. There was a choice of ice cream, apple cobbler tart or cheese. Well, I know Mr MWCED is a ginger fiend, and I always enjoy delicious ice-cream, so no contest really. The ice-cream was a Gourmet dessert of blackcurrant and blackberry ice cream and gingernut ice cream Oh die and go to heaven, two of my favourite flavours. It didn’t disappoint. The spoon was busy, the taste buds were delighted, and I finished feeling very replete. Oh if only every flight was as tasty as this one. Total thumbs up Air New Zealand.